The Donington Park racetrack, in the east Midlands, has been in the news for all the wrong reasons for the last year or more after a failed bid to host the British Grand Prix saw it left in a condition unsuitable for use. If it had closed then the country would have lost one of its best facilities, for fans of both four-wheel and two-wheel racing. The track is widely regarded as a classic, not least because of its gradients and swooping, flowing curves. And Donington Park, lying as it does so close to East Midlands Airport, is less vulnerable than many circuits to the kind of peripheral housing development and subsequent noise complaints that have imposed severe limitations on tracks around the country. Over the last few weeks the future has been looking increasingly brighter with a big show of fan support, the commitment of owner Kevin Wheatcroft to restoring the track for racing by August and finally the announcement of a new leaseholder with a seemingly realistic plan for bringing racing back. Just before that happened, however, Donington played host to an event that attracted hundreds of keen racing fans. It was a festival of slot car racing – a whole world of single-seaters, prototypes, road cars, trucks and almost any other vehicle you can think of played out in miniature. This frustrated feeling, immortalised by the band Half Man, Half Biscuit, was often exactly what slot car racing turned out to be like, at any rate when we were kids. And, like children of any era, we were a bit short of patience for painstakingly troubleshooting dead track sections. We were rather heavy-handed when it came to the delicate cars and there were some embarrassing breakages almost directly out of the box. As kids we tended to want instant results rather than the longer-term rewards of creating a layout and then getting to know its characteristics with different types of cars. In short, slot-car racing had flashes of brilliance that hinted at how much fun it could be. But it often ended in disappointment – and that’s if you were lucky enough to own your own Scalextric set. 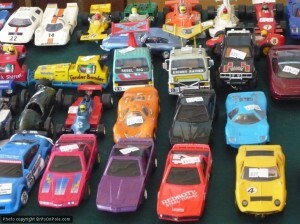 If you were having to constantly beg friends, cousins or older siblings to give you a go, because your parents simply could not be brought to appreciate the importance of your personally and exclusively owning this desirable toy, then it was a dead loss as you were repeatedly outclassed by those with greater experience. Filed under Events and happenings and tagged with Donington Park, slot car racing.